We have been having a review at Badgers and as much as our four legged, waggly tailed friends are still very welcome at Badgers Sett Holiday Cottages, we have decided to keep Thyme Cottage 'Dog Free', allowing guests with pet allergies to come and enjoy a holiday in one of our pretty and spacious two bedroom cottages too ! I must mention the fun we have been having whilst exploring The North Coast of Cornwall's lovely sandy and (some) Dog Friendly beaches - with simply miles and miles of the stunning South West Coastal path running alongside to enjoy. Myself, 'Him that Does', and friend Rowena, along with her two bouncy dogs Banjo and Ginny have certainly made the most of this lovely area recently, which is just a short drive from Badgers Sett, as photos taken at Constantine Bay below, show! Rick Stein's gastro pub The Cornish Arms also happens to be located nearby, so we popped in for a tasty lunch, the staff are very friendly & the dogs were invited to join the party too .... what's not to like? This is definitely one to be added to our Welcome Books! 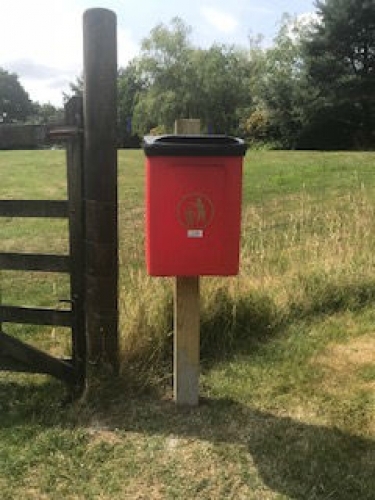 We have 1.5 acres of gardens for our four legged friends and their Human owners to enjoy, plus a recent addition of our very own Dog Poop Bin installed beside the entrance gate to the main gardens, helping owners to responsibly dispose of their dog poop bags with ease !